Blueberry fields forever. 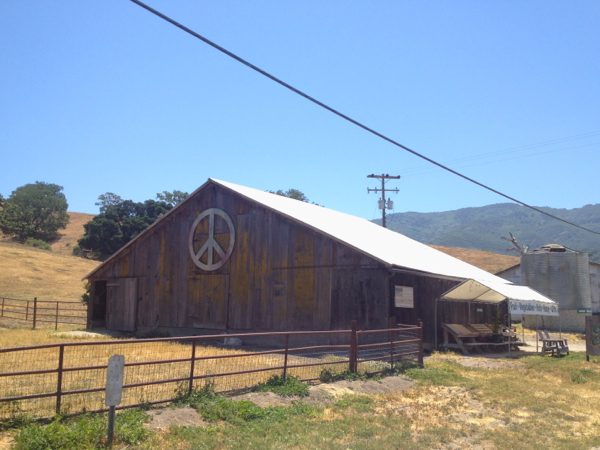 ♥ California, spring 2014. 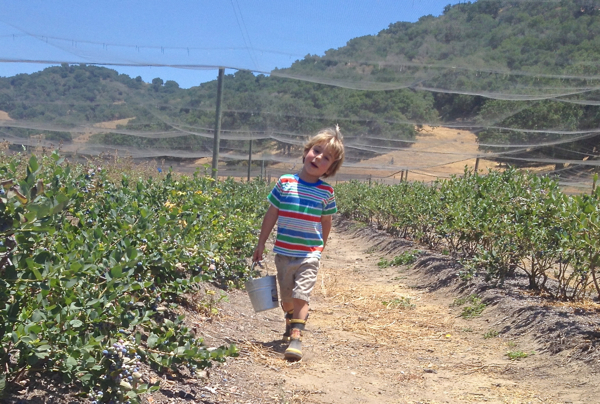 Back when we lived in Portland, our summers were always filled with u-pick adventures. Morning gatherings out on Sauvie Island, where the kids would run wild through the berry fields, and the farm stands were overflowing with produce to be purchased for a song. My friends and I would buy or pick while things were cheap and in season, then spend our afternoons and evenings processing, freezing, canning, and fermenting, so summer’s bounty would last us well into the winter months. It was awesome. It’s the way I want to live. 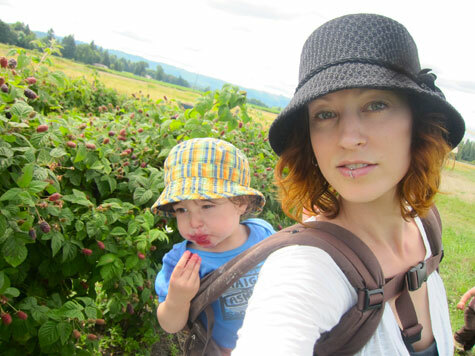 Berry-picking on Sauvie Island, summer 2011. These past few years have been transitional, and have come complete with all the difficulties and concessions that transition tends to include. Now a divorced parent, a graduate student, a working mom – this new path has put a very different set of constraints on my life. Back in Portland, for example, I’d always buy dry beans in bulk and cook up big batches from scratch, carefully portion them into smaller containers, and then freeze them for later use. But now I buy canned beans. Because it’s quick and convenient, and at this point in my life, I have to be okay with that. We’re all doing the best we can. Going back to grad school added a lot of extra work to my life (obviously), but it also added routine. And a sense of direction. In many ways it’s quieted the anxiety I’d felt for so many years. And because of that, it’s actually opened up a lot of space in my life. So what’s the point of all this? Well, the point is, I’m finally getting back into my kitchen-witchery groove. 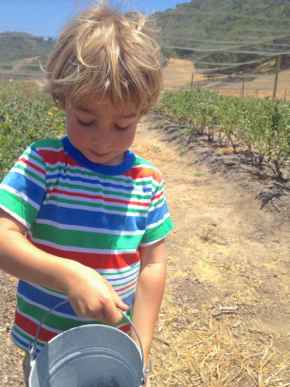 And this past weekend, for the first time since we moved to California, Waits and I visited a u-pick farm. 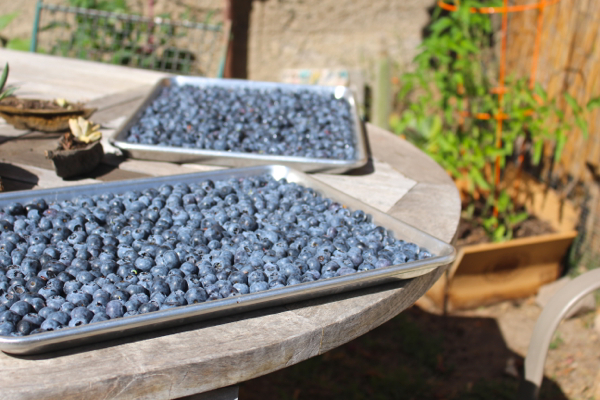 We picked for about an hour, and we ended up with 8 pounds of blueberries. For reals! 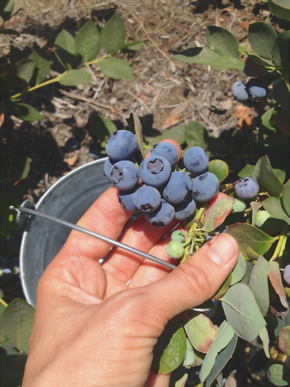 These California berry bushes are not messing around – they were literally dripping with giant, plump, perfectly ripe berries. I was so excited, I went straight home and got to work . . .
Freshly washed blueberries, drying in the sun. This will be so good on my epic salads! When Jeremy got home from work, we all had a picnic dinner outside. 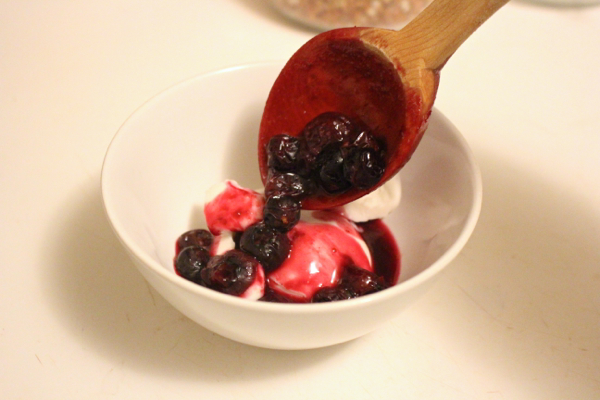 And then for dessert . . .
. . . a quick homemade blueberry compote over vanilla bean coconut milk ice cream. Holy moly. This summer I’m planning to do a whole lot more gardening and preserving. So my question to you guys is – What do you want to see? Which fruits and veggies do you want to see preserved? What sorts of projects and preservation techniques are interesting you? I’ll be starting a summer gardening series, just sharing what I’m up to around my own yard, hopefully beginning next week. I’m so excited to bring this component – which was really a formative part of this blog – back into these pages. So please! Thoughts, ideas, suggestions. What do you want? And my dears – have a great weekend! Yay!!! The first thing to jump to my mind was that I’ve got the basics of preserving down (I can do jam, tomato sauce, applesauce, frozen fruit and veggie purees, that kind of thing), but I’d love to break into the next level. I’d love to hear more about infused spirits and vinegar, and more interesting things to do with fruits and veggies than just jams and sauces. Happy Weekend Lovely!!! you know, i loved your “i buy canned beans. what?”. that’s just awesome. i get trapped in this insanity of “gosh, am i REALLY making the right choice buying my coconut milk in a can (even bpa-free) vs tetrapak (vs a coconut)? which homogenizers does it have? which gums? is there plastic on that glass jar lid?”. ugh. 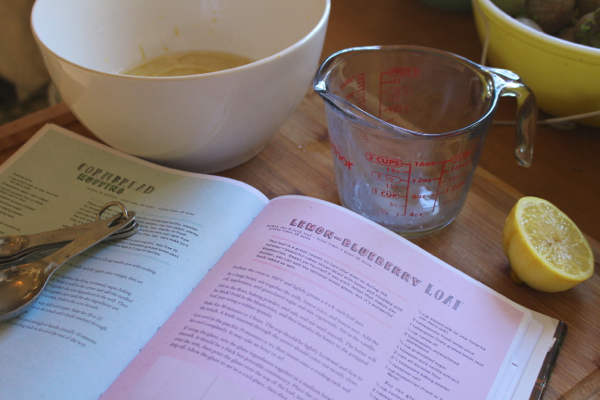 i want to see more recipes. i’ve made that dahl three times since you’ve posted it. i loved how ingenious your salad formula is (and obvious once you actually see it, you know?). yeah. not a grad student anymore, but a postdoc with not much more $ and even less time and flexibility! so bring it! I know nothing about preserving, so any information is appreciated! Hello! Great idea. I would be really interested to see how to preserve veggies long-term in innovative ways. It’s something I struggle with quite a bit! That takes me back to when I lived in Saskatoon, SK. 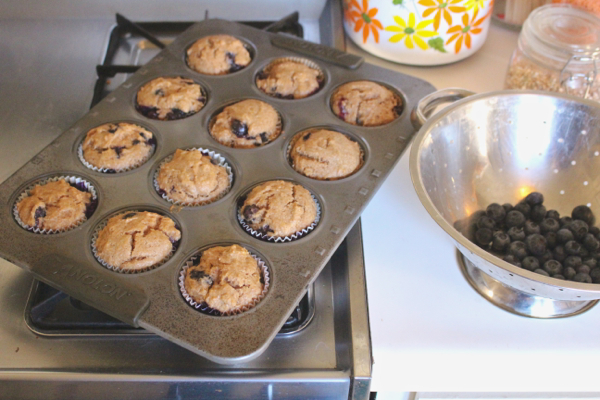 I would go out of the city to pick Saskatoon berries, although I didn’t like them! The act of being out in nature, harvesting my own berries was so much fun… I would just happen to give them away to my friends! Hey Lynn, oh yay – we’re definitely planning more infused spirits and a whole infused vinegar/mocktain series this summer! So definitely look out for that. As far as fruits and veggies, I’m on the lookout for some cool + new ideas. Thanks for weighing in, and I hope you have a great weekend as well! Yeah, there’s just too much pressure on people (*especially* in the healthy living online world) to be doing it all, to be staying as pure as possible, etc – which i agree with in theory but man! We are just real people living real lives! We need to have some perspective and a more practical approach (and the guilting does NOT help anyone). Haha, obviously I feel strongly about this! I’m so glad to hear you want more recipes! I actually love doing recipes, so I’ll d=keep that in mind for these coming months. Thanks Angie! Have you checked out my archive? I’ve got tons of great tutorials for things like homemade sauerkraut, kimchee, fermented pickles, etc. Very fun! Thanks Monika! I’ve loved aeeing all your garden pics coming out recently as well. And pregnant skink, OMG! 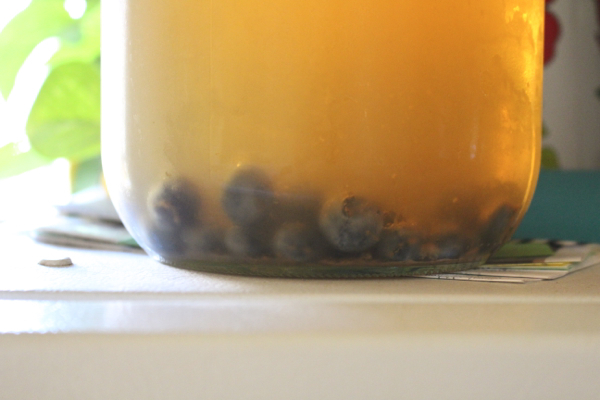 I’m playing around with kombucha again but finding the SB climate is making things difficult . . .
Hi Bon, do you do any fermentation? That’s my number one favorite way to preserve veggies, for sure. But yes, I’m also looking at innovative ways to preserve, beyond freezing and fermenting! I’m excited to see all of your preserving techniques! I’m planning to can for the first time this summer and really looking forward to having some of our summer produce on hand for the winter months. How do you controle pests? Also any tips for miximazing the yield would be awesome! I’m looking foward to learn from you! I recently started making my own pickled jalapeños that are so hot and awesome at the same time! Really want to start learning how to pickle everything!! Would love to get into canning but am a bit intimidated by the whole process. Glad to see you so happy and healthy! Waits is the cutest…. Oh I’ve been looking at going berry-picking this summer! I don’t suppose you are in the NorCal area are you? 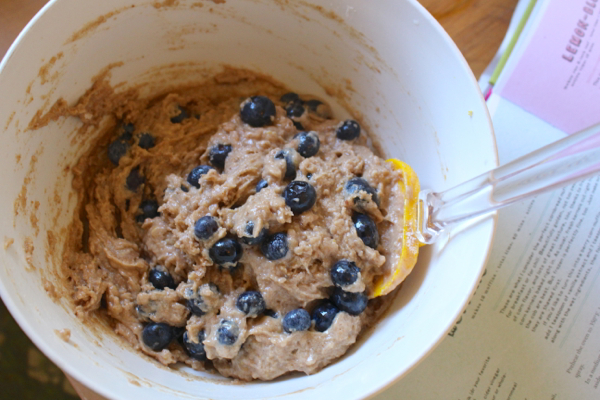 Gorgeous pictures =) Blueberry & lemon is such an awesome combination.